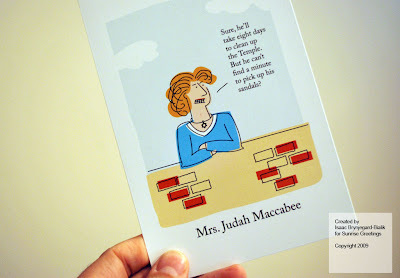 Isaac Brynjegard-Bialik: Nice Jewish Artist: New Hanukkah greeting cards now available! I received a package today from Sunrise Greetings, a card company in Bloomington, Indiana. I do some card design for them every so often, and today's box had samples of three Hanukkah cards I designed and illustrated for them. 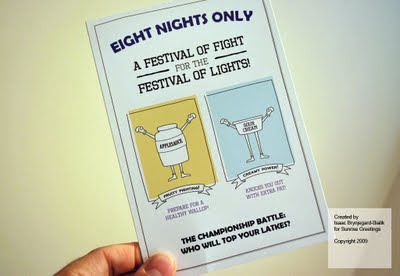 The first features Hebrew lettering ("nes gadol haya sham"), embossing, and silver ink; the second is a fight card for the battle between applesauce and sour cream; and the third is a humorous reflection from Mrs. Judah Maccabee (click the pix above to see them larger). 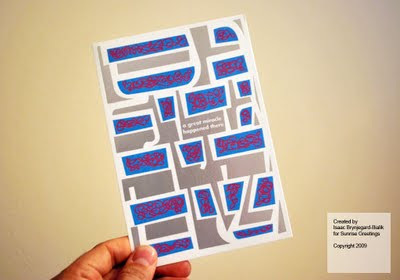 If you want to order some for yourself call Sunrise Greetings at 800 457 4045 and ask for the new Hanukkah cards by Isaac Brynjegard-Bialik (item #s PHHGC.97840.1, PHHGC.97846.1, and PHHGC.97847.1)! All three cards are copyright 2009 by Isaac Brynjegard-Bialik for Sunrise Greetings.